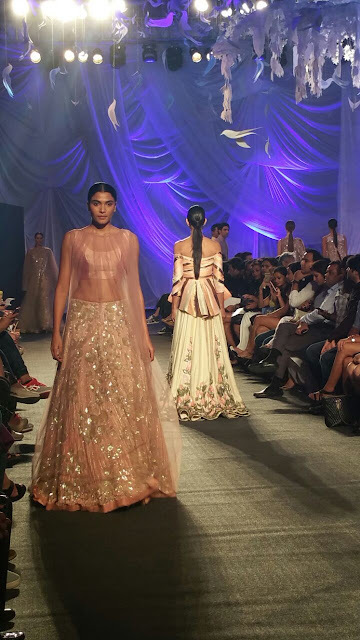 Last evening Mehboob studios in Mumbai was abuzz as Manish Malhotra, Couturier to well known stars opened Lakme Fashion Week (LFW) Summer/Resort 2016 with Elements- his spring/summer 2016 Haute Couture Collection presented by #LYFsmartphones. With the "Elements" collection marking a new direction for label "Manish Malhotra" we went eager-eyed to witness the grandeur & scale attached to the designer and were bowled over. 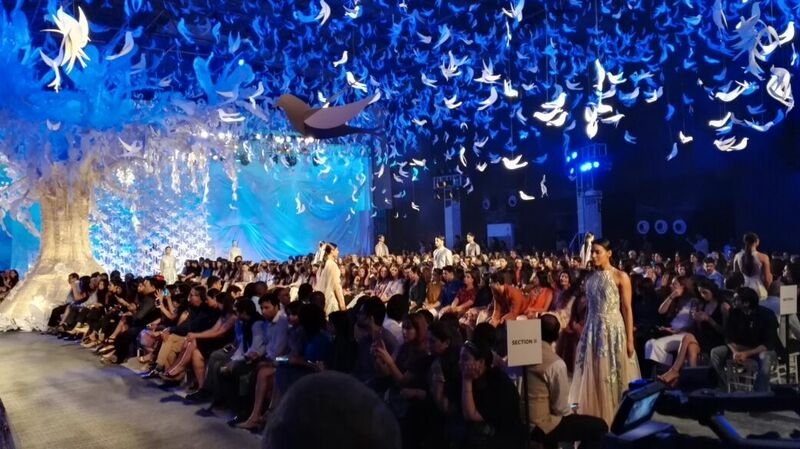 The show witnessed glamourous attendees like Kareena Kapoor Khan, Farah Khan, Dia Mirza, Mrs.Nita Ambani, Kanika Kapoor and more applauding the designer from the front row. The guests happily posed for photographs & gave bytes about what they expected from the upcoming show. Drawing inspiration from nature for his Elements collection, the designer presented the collection consisting of 70 ensembles apt for summer weddings & festive celebrations. The four glories of nature- Earth, Water, Wind & Flame blossomed on the runway in form of glamorous variations to traditional yet modern Indian couture. The runway itself was a sight to behold- white backdrop that featured "Tree of Life" was in perfect synergy with the collection. 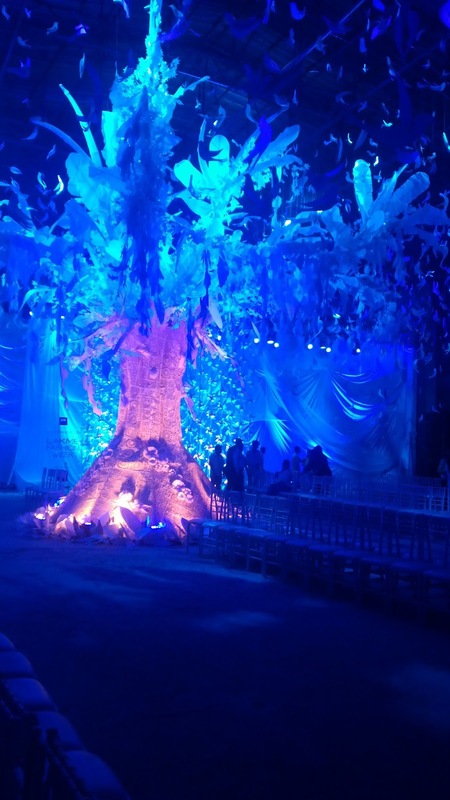 The beautiful Tree of Life at the show. The glamorous collection with a touch of global influences boasts of a dreamy allure in every ensemble that makes it a fabulous addition to a summer bridal wardrobe. One after another beautiful models walked the runway in cocktail dresses with saree drapes, lehengas with capes, off shouldered jump suits with Victorian trails, tailored ponchos & overlapped trousers. The cuts are sharp & asymmetrical & the ensembles have intricate detailing to lend an edge to every outfit. Beautiful pastel shades of ivory, baby pink, powder blue, mint green & sunset orange in fabrics like cascading tussar, crepe & organza makes one think of beautiful open air wedding ceremonies. The Elements Collection also presented a capsule collection for the modern Indian groom with sharp jackets, kurtas, tailored pants & churidars. The collection truly showed the expanse of possibilities that young brides & groom to be can explore for their big day in outfits that are stylish yet breezy enough to have fun with. The resplendent Jacqueline Fernandez in a pastel pink gown & sheer cape & the dapper Arjun Kapoor in a blue kurta pants closed the show to an applauding audience. 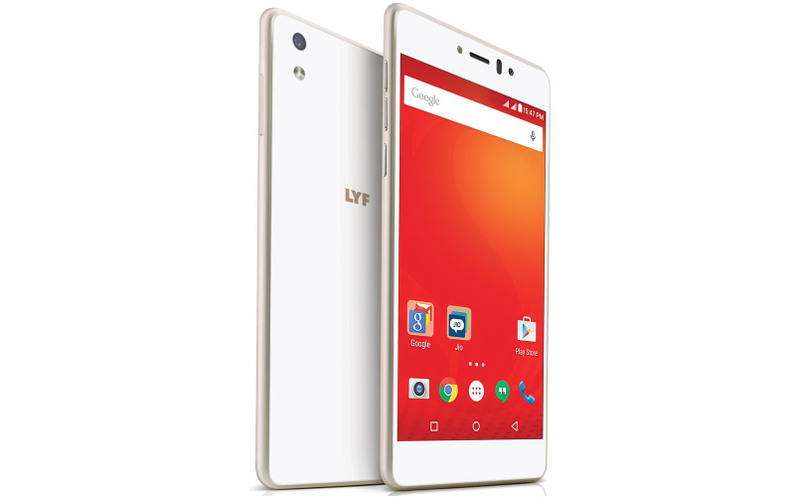 The models showcased the LYF Water 7 Smartphone on the runway. The #LYFsmartphones come with a captivating display, true 4G experience, an amazing 13 MP primary camera & 5 MP front camera with professional camera modes & settings. 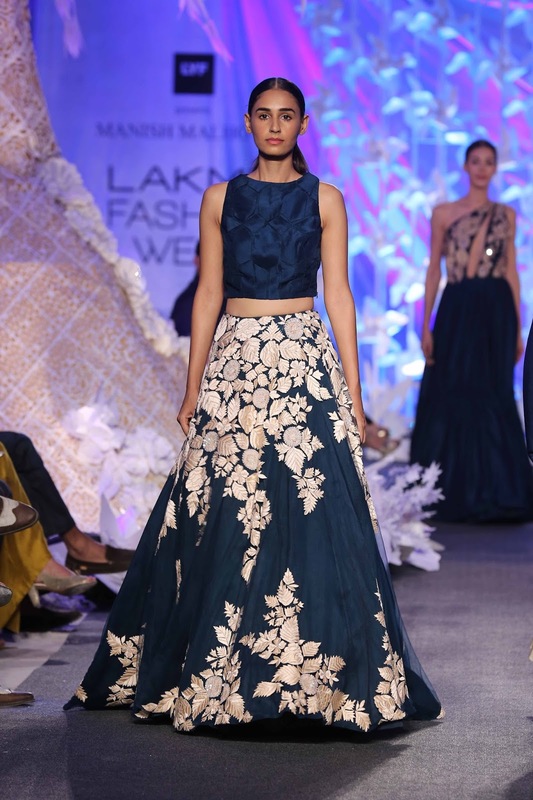 LFW, jointly organized by Lakme & IMG Reliance was conceived & created with a vision to "Redefine future of fashion & integrate India into the global fashion world" is held twice a year. The LFW Summer/Resort 2016 will be held from March 30 till April 3 2016 at St. Regis, Mumbai.